I have a real love of COLOR!!!! Creating Color on a BLACK (or Dark) surface is always a challenge. 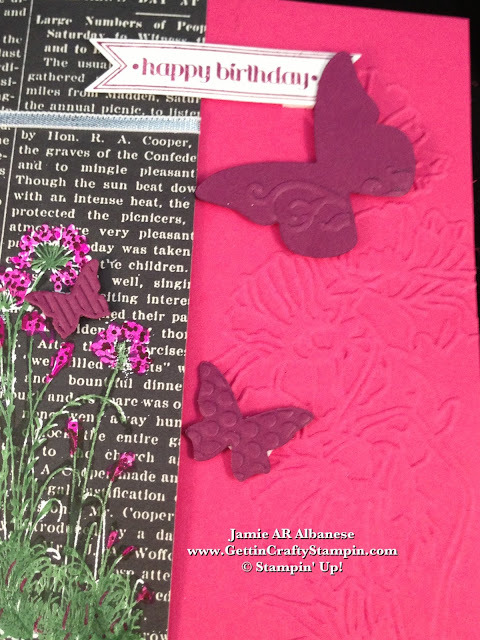 There are ways.... like with Colored Embossing Powders... but this is a fun way to get a multi-tonal look and oh so easy!! See the VIDEO Tutorial at the bottom and let me know what you think! My Celebrando Creatividad class was such fun! We created these colorful babies and I don't care what language you speak - this card is sure to brighten your day!! Creating Colorful images on a dark/black surface is a challenge! CLICK HERE to see a card that I created with this technique this summer with this technique... the cool thing about this is that you can use it in so many fun ways! This card was pulled together with the aide of our Color Coach. The Color Coach (#130118), a favorite tool of mine, helps to pair colors in favorable ways - and I'm always pleasantly surprised how they look so chic and stylish! Here it combined Melon Mambo with Rich Razzleberry and Old Olive. 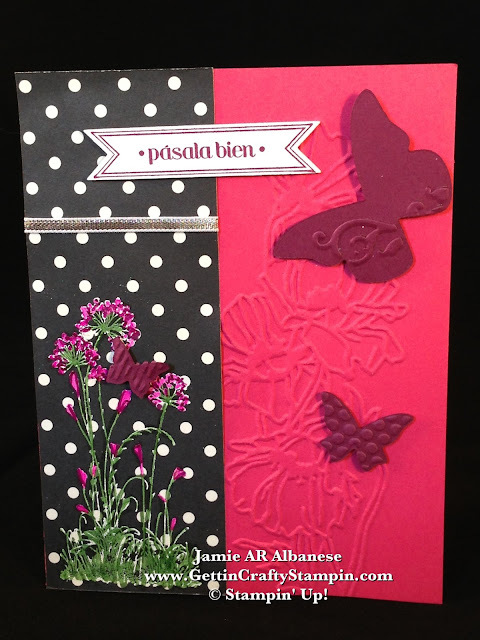 With Melon Mambo card stock (#115320) I emboss it with the Big Shot Die-Cutting Machine (#113439) and the Flower Garden Embossing Folder (#123113) so that it mimics the Serene Silhouettes (#127324) flowers. 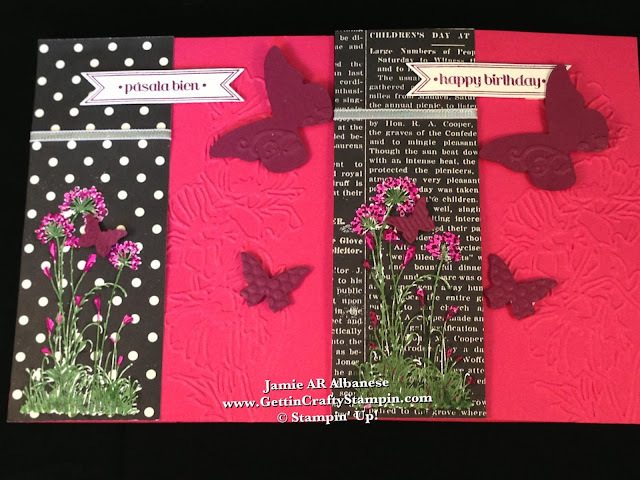 The Modern Medley (#126926) Designer Series Paper allows for me to MIX my patterns. My 7 year old enjoyed helping me create these colorful cards. 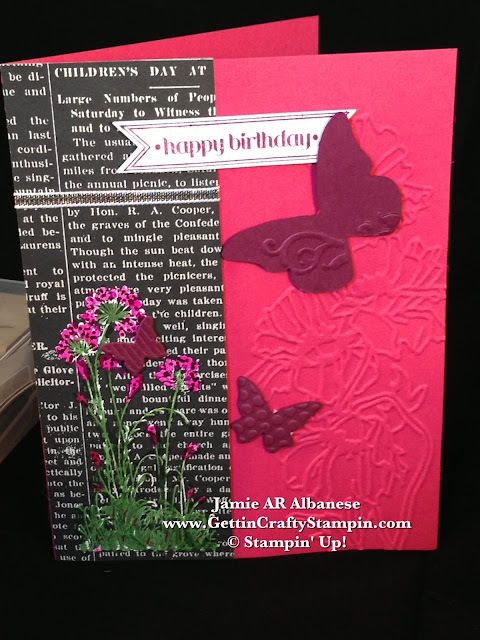 Attaching the Rich Razzleberry card stock (#115316) that was embossed and die-cut with the Big Shot and the Beautiful Wings Embosslits (#118318). 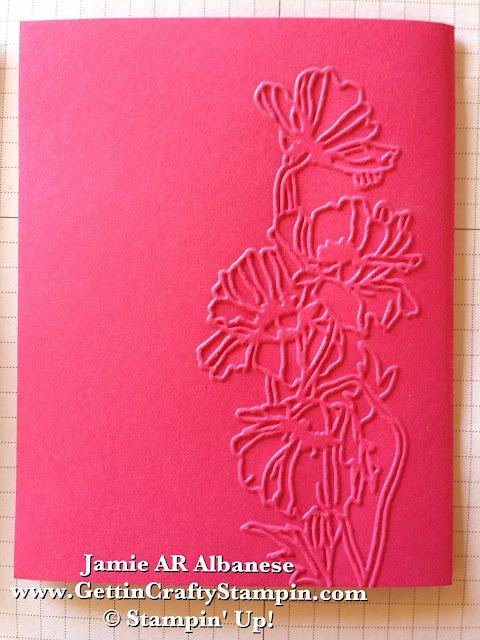 Here it mimics the embossed flowers while continues the feel of nature. 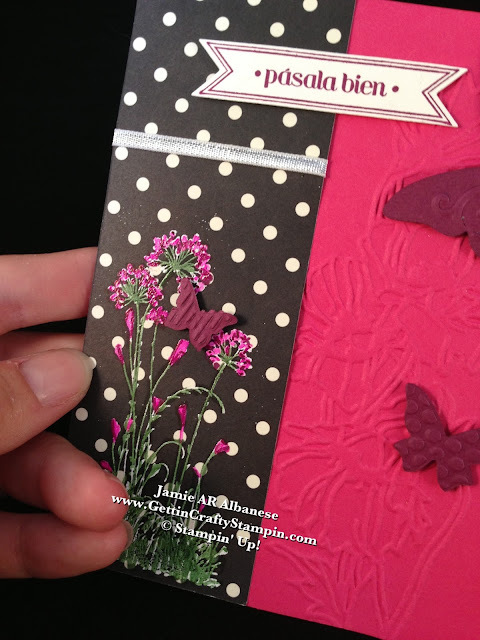 Even with out the embellished paper or butterflies, this embossed card is oh-so-lovely, isn't it? Itty Bitty Banners (#125257) is available in English, French and Spanish. It also lines up with the Bitty Banners Framelits (#129267). These framelits are extra easy to create flags - especially with the new Big Shot Magnetic Platform (#130658) for my Big Shot Die-Cutting Machine (#113439). Dashes of Silver with the new Silver 1/8" Ribbon (#132137) in our Holiday Catalog (pg. 28). I love the addition of this metallic accent. Create this cool and colorful flower on this pretty black paper! Both sides of this Modern Medley really POP when you Prep the page with the Embossing Buddy (#103083) for a CLEAN Embossed Image (such an important and often forgotten step in heat embossing - it makes SUCH a difference!). Stamp the image with the Versa Mark stamp pad (#102283) and heat set White Embossing Powder (#109132) and Heat Tool/Gun (#129053) for this Sharp White Flower... it's PRIMED to create a COLORFUL Image!! See THIS VIDEO (below) for a quick step-by-step on how to create these Cool Colorful Images! Thanks for Coming by for a visit! I post daily - so SHARE ME with your Friends and Family! Join the Exclusive Gettin' Crafty Stampin' Mailing List and be 'In the Know' on crafting and my exclusive specials as well as BONUS FREE WOW Projects! 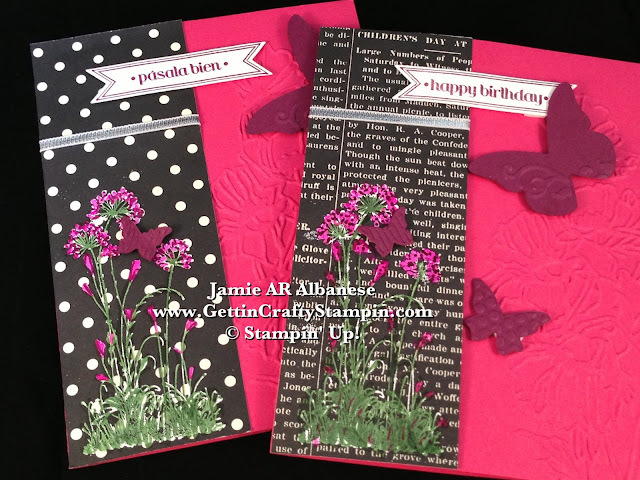 Receive my On-Line Bonus Class each month when you join the Gettin' Crafty Stampin' Virtual Club! WOW Projects that are sure to Rock Your Day!